This week, I got the chance to see Ti West's new horror film The Sacrament. How does it stack up to his previous movies? As anyone who read our Top 10 Horror Movies of the Past 10 Years post could tell you, I am a big fan of Ti West's The House of the Devil. It's a brilliant homage to 80's horror but has a modern level of intense suspense that makes it one of the scariest films I've ever watched. While I didn't enjoy The Innkeepers quite as much, it had a similar style and level of suspense that I really admire. 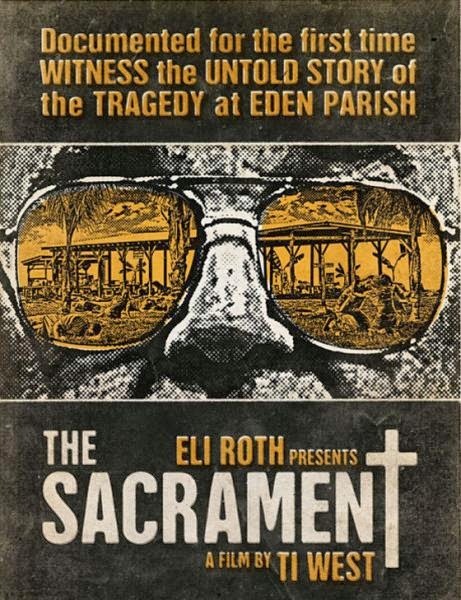 The Sacrament does not follow the same formula as his previous horror outings, taking instead an extremely modern approach: a documentary style film that is set up as an article for the real-life Vice.com. Patrick (Kentucker Audley), a fashion photographer, learns that his drug addict sister who has been missing is in some sort of utopian commune in Africa, and has asked him to come visit. The circumstances are intriguing and mysterious enough that a two-man crew from Vice, Sam and Jake (AJ Bowen, Joe Swanberg) decide to go with him to document the situation. Despite the frightening armed guards, the community, known as Eden Parish, actually turns out to be all it claims to be: healthy, clean living. The visitors are welcomed with open arms and are given honest answers by a wide variety of people as they walk around and interview member of Eden Parish. Sam and Jake begin to see their cynicism erode bit by bit, but are nervous about their upcoming interview with the leader of Eden Parish, known only as Father. The interview sees how manipulative Father (Gene Jones) can be, and how his charming personality takes over the interview and twists the questions back at Sam. Things are, of course, not all they seem: the situation becomes creepy very quickly as Sam and Jake begin to discover the dark underbelly of the cult, and soon they are trying to escape with their lives. While the story is fairly compelling, it lacked the sense of foreboding that West's previous films handled so well. While the way the film turns dark is relatively creepy, the inevitable third act is extremely predictable and not terribly satisfying. This has been a problem with other movies as well, as The Innkeepers has a very upsetting moment towards the end and then just sort of...ends. While a movie doesn't have to have a twist to be good, this set up requires a good one, and the movie just sort of peters out towards the third act. One of my main complaints, however, is the opening credits. Keep with me now, they actually had a major bearing on how I took the film. The opening scenes set the movie up very well for the documentary style: there is on-screen text that gives us some background, as well as meeting the principle characters in New York, working for the real life company Vice.com. The title screen is actually really awesome: while Sam is brainstorming the title of the article, calling it something like "The Family Reunion" the disturbing text of the title "The Sacrament" fades in, flickering like old film. However, the credits roll with pop music and fashion-styled name plates, and the effect of this being some sort of found footage film is completely ruined. I get that this is supposed to mimic a real web video, but having already established that something is going to go wrong, this totally threw me off. Maybe a silly complaint, but it legitimately irked me. The performances are actually quite good, and Sam and Jake in particular really sell the documentary aspect. They both are very believable and have a natural chemistry. There are a couple of clever bits of using the camera as a player in the story, and for the most part they do a good job of explaining how they have b-roll footage, etc. The setup for the third act allows for a fair amount of emotion as things go from bad to worse, but for the most part, we don't have a connection to anyone in the community, yet they are more victims than the main characters. There are a handful of moments that are pretty frightening, but unfortunately they are pretty scarce for most of the film. The real problem with the movie, in my opinion, is that suicide cults are not a good topic for a horror movie. Sure, the idea in the real world is pretty terrifying, but it is difficult to bring any kind of suspense to a movie that takes place primarily in an open field in broad daylight. I admire the attempt, but as much as I was looking forward to the movie, I saw none of Ti West's signature style that I love: no throwback to a different era, no great music, no tense anxiety, and only a glimmer of the clever-but-real characters who's situations make The Innkeepers and The House of the Devil so terrifying. I give it a C.
The Sacrament is set to have a limited U.S. release on June 6th.